BRP MP62 setup - Miata Turbo Forum - Boost cars, acquire cats. I just bought a used BRP MP62 hotside setup for my NB1. I am currently running a JRSC M45, it's one of the older kits which has the little black box that tricks the ECU into thinking it's cold outside to add fuel under boost (so effectively no engine management besides stock). Needless to say I have a couple of questions, and since this forum has more knowledge in this arena than others I am on (and the self-proclaimed lord of S/Cing) I figured I'd ask my questions here. A little background on myself, I am currently on a ship in the Atlantic (not the Navy). We get our Internet connection via satellite which is slow at the best of times, moreso depending upon the weather and how many people are downloading ****. I do try searching for things but since BRP is no longer around it's difficult at best trying to find information. I work on things for a living so can do pretty much everything, but I'm just starting in the world of electronic engine control and boost. The kit that I bought has the 'charger, pulleys for 6 and 10 psi, and an intercooler. No engine management. I was planning on buying a DIYPnP (probably from Braineack as my time home is limited), however I received an offer from someone elsewhere of a BRP module that I am told was specifically made for this 'charger. 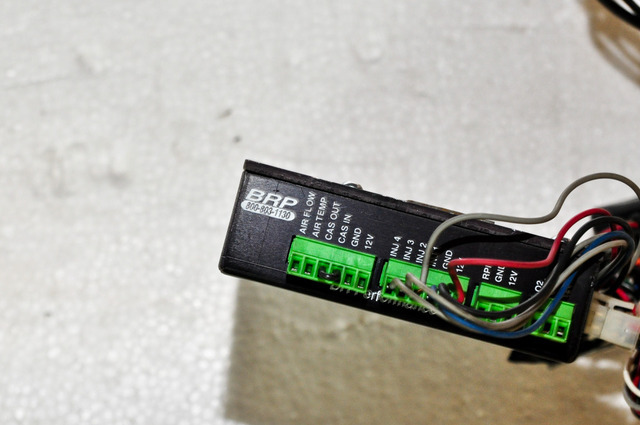 It consists of a small black box with wiring connections coming out of it (looks like they hook into the factory harness) and a PowerCard also attached. I know that the MS based unit will be better overall, but would the BRP unit do the job as a temporary measure? I guess my main concern would be if it can handle the higher boost, intercooler and bigger injectors. I already have an Innovate MTX-L waiting at home. I recently bought a set of Supra 305cc injectors. The guy I bought the 'charger from was running 550cc injectors with a Hydra ECU on his. Am I going to need something bigger than the 305s to run 10psi safely? I appreciate any and all help/guidance anyone can give. It probably goes without saying that I'll ignore the turbo guys who tell me to go that route (already have that with my Speed6, I'm liking this form of boost on the Miata). Don't let that stop you from having fun though! Get an enhanced DIYPNP through me, get a well-tuned map for a 1.8, M62 intercooled with Supra injectors as well. You'll have it installed and be driving around in minutes. PM me for details. I have the same BRP set up on my 2000. Currently running 6psi with stock injectors and the powercard. You mention another black box which I have to figure is some kind of timing control. The standard powercard just needs power and ground and to be cut into the injector wires so it can add fuel under boost. It's pretty low tech and wastes a lot of power that you can get back with a 'squirt or other ecu replacement. i made more the 40hp going standalone from powercard and timing card. Thanks for the input guys. I did some searching last night, from what I was able to find I suspect the BRP module I was offered is a Bipes ACU with the power card hooked into it. So yeah, the MS is definitely the way to go. Any thoughts on my injector situation? Can I get away with the 305s, or should I look into something a bit bigger (I see I can use some 465s out of an RX-8, wonder if the wife would miss hers?). At 7-8psi, the 305cc will see 92-95% duty cycle to reach 11.8 AFR. So you definitely need to upgrade if you are looking for 10psi. I also have maps for the same setup, with the RX-8 yellow 425cc injectors. These are good for up to 12-13psi. 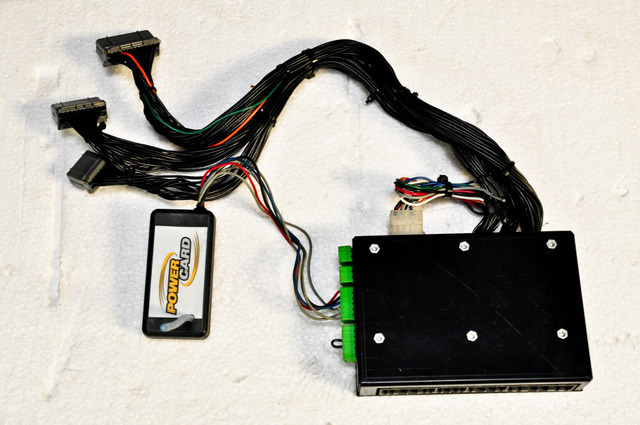 If you want to get power then upgrade to an ECU, You will get more BHP and also better MPG. I have got a MP62 kit installed on my 1.6 NB and with an intercooler and ECU it flies and is a joy to drive. You've made the right choice . Thanks, I'm pretty excited myself. Looking forward to the 50 or so additional horsepower I should have when everything is installed. Has anyone had any experience with the (supposed) larger outlet manifold Moss sells for this 'charger? I know larger isn't always better, they claim 10 hp additional just from this change but I am wondering if the shape might set up problems with flow. Since there was some uncertainty about the other control setup I have been offered I'm posting pictures of it. Maybe someone who has some history with BRP will be able to tell us what it is. Looks like an interface box to me. It looks like you plug the harness into the ECU and the car side ECU connecters into this box. I'd bet there is nothing inside it other than wires. Can you open it up and see what is inside? I remember a version of this had a Powercard in it. The BRP fabricated outlet is TERRIBLE for flow. The Jackson outlet that TDR sells HAS to be good for 10hp at your power level. And I wouldn't bother with any of that silly band aid/ black box nonsense. Buy a DIYPNP/ MSPNP from Brain/ Revanant/ DIYautotune, and you'll be MUCH happier in the long run. It isn't mine, something that has been offered to me. If I had it it would have been opened already! Thanks for the info on the outlet mani. I have already made up my mind to get a MS, I was just posting about the other in case someone else is looking for information and comes across this thread. There are so many performance parts (for any car) that come and go, and when you try to dig something up it can be a daunting task. If I can add to the general info pool I will. Great find, I bow to your research skills. I'm still getting up to speed on which company became what in the Miata world (hell I'm still trying to come to grips with losing Rotary Engineering in the RX-7 world, and that was years ago). If you are serious about buying it I can point you in the guy's direction (he was on CR). A member on Nutz tested before/after with the BRP/MOSS outlet. If you are serious about buying it I can point you in the guy's direction (he was on CR). At the 230hp level, the Moss high flow outlet netted a MT.net poster, a reported 6 hp. The 2 dyno runs were made on the same day.